GIG Economy: What does it mean for your business and how will it change the landscape of your business? How many of us even know what the GIG economy is? 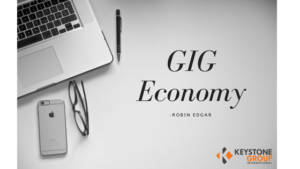 The dictionary defines it as “a labor market characterized by the prevalence of short-term contracts or freelance work as opposed to permanent jobs.” The gig economy gets its name from each piece of work being akin to an individual ‘gig’. The topic of the GIG economy is becoming more and more prevalent with an ever-increasing number of articles and meetings touching on this subject and how it is changing the landscape of the workforce. Have you asked yourself what this might mean to you and your business if you are a business owner? What about if you are an employee, what might it mean to your job or career? There are many stats and a growing body of evidence and information about how many people are choosing to be freelancers and independent contractors for flexibility, work-life balance, a wider variety of work and ability to earn more money each year. Employees seem to be less worried about the safety and security of working with one company for many years. When I look at a large number of people that are moving into this new economic workforce it tells me that business owners will want to figure out how to integrate this change into their hiring processes quickly. The benefit could be a chance to employ niche experts that will come in and work on a specific project or specialty and then allow them to move on to another company when they have finished. What are the ramifications in our society of this burgeoning class of workers? Will they be prepared for this 1099 world? Will they realize the importance of being financially prepared to pay their taxes, evaluate and find the benefits they need but are no longer offered through their employer, such as health insurance, life insurance, IRA/401k, disability insurance, just to name a few. We live in a world where the business owner has taken care of so much for the traditional W-2 employee that it will be a big shift to see if everyone will be fully prepared to take over many of these important pieces of their life? Where will they find the answers? What could be a huge benefit for business owners and companies by shifting the responsibility of paid vacation, sick pay and all the benefits to the individual will soon become a huge change and burden for those people in this GIG economy looking for more freedom. With freedom and flexibility will come more responsibility in taking care of all of the benefits. Ensuring that these new freelancers understand the requirements and adjustments they need to make in their insurance, taxes, benefits and business reporting in this new world. The GIG economy is here and growing rapidly so the critical infrastructure of connecting these businesses to the freelancers will be important and we believe one that will prove to satisfy all parties in the process.